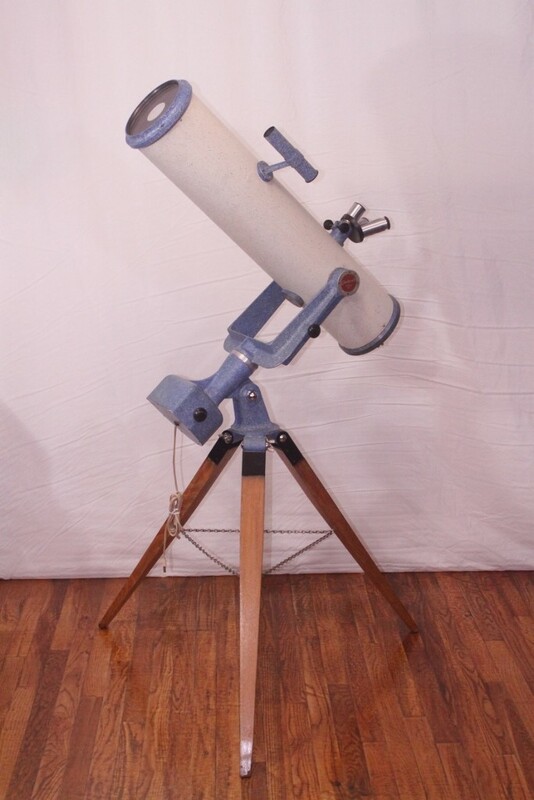 This is an ultra rare telescope from the late 50′s. Apparently there were only a few made and a scarce handful are known to have survived. This one makes thirteen as of the last count. I purchased this in November, 2016 from an Ebay seller who said it was from the estate of a long time amateur astronomer in Memphis. When the scope arrived it appeared to be in great shape. Testing under the night sky showed that it had great optics. There are a few minor specks and flaws on the mirrors but no serious problems. 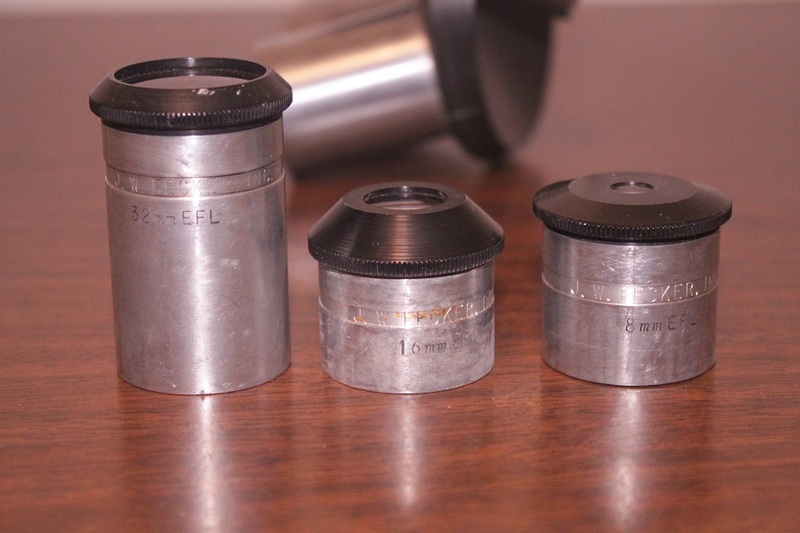 The eyepieces are clearly marked J.W.Fecker and have focal lengths of 32mm,16mm and 8mm. The finder eyepiece is marked 1.00″ and also has the Fecker brand on it. They are all in superb condition, except for the finder eyepiece; the once present cross hairs are no longer there. The eyepiece turret seems to be like new except for a little tarnish. The clock drive works perfectly. The beautiful original Zolatone paint is in good shape over nearly the entire surface. There was a lot of rust on many screw heads so I removed and cleaned them. The finish on the legs had perished so I cleaned them and put a coat of polyurethane on them. The metal brackets on the legs were highly rusted. I cleaned and painted them. The leg chains were heavily rusted so I removed the rust. 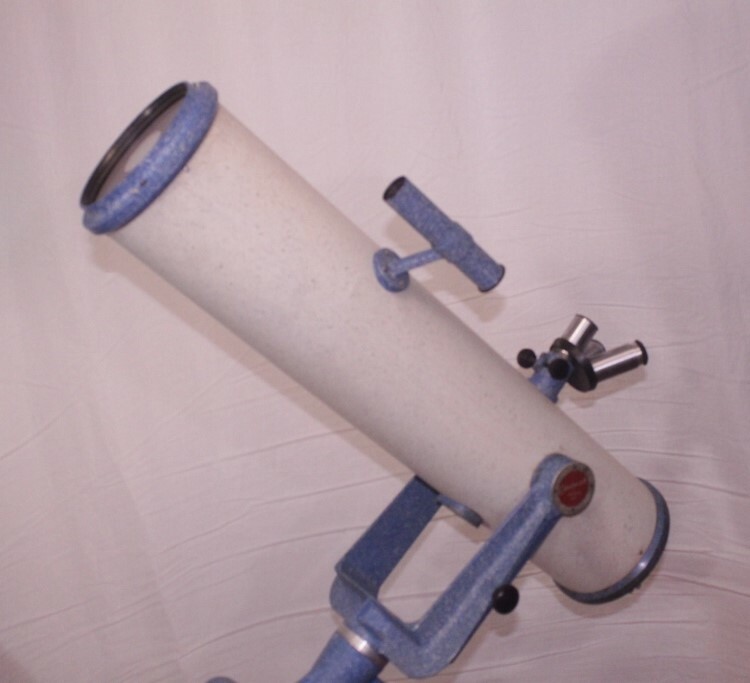 It is a beautiful telescope. This entry was posted in Vintage Classic Telescope on November 18, 2016 by DaveTrott.